We sell a lot of our Triangular Picnic Tables to public houses, commercial parks and general recreational facilities – probably because of the unique, attractive design that is solidly constructed throughout. We are currently offering a bulk purchase discount when you buy five. That’s not to say domestic buyers won’t enjoy them as a novel alternative to the standard design of picnic table. 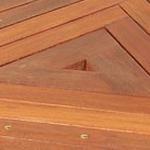 Made from Merbau Hardwood which is tough wearing and has a lovely rich, reddish-brown colour to it the concentric, triangular design looks fantastic particularly on the table top itself. Merbau Hardwood is often used in hardwood flooring due to its very hardwearing nature and high resistance to rot and insect attack. Its use in these triangular picnic tables offers a quality product that is second to no other and will stand up to the rigours of regular commercial use for years to come. There’s room for six people on the seats comfortably. This makes the patented Winer design perfect across a wide spectrum of users. The legs are chunky and thickly set and it has a solid, bolted construction – this combination makes it very unlikely to develop that annoying wobble over time. The clever design also incorporates a hole in the middle for a parasol to be added if required. Overall, very functional and fit for purpose but attractive at the same time. If you require further assistance please speak with our friendly Sales Team in the Midlands. Thank you so much for the speedy transaction. The picnic bench looks great, comfortably sits six and is great quality.